How Hot Is a Poblano Pepper? A poblano is a mild variety of chile pepper native to Mexico. According to Weldon Burge, author of "Grow the Best Peppers," the poblano is among the most popular peppers in Mexican cooking. According to Dave Dewitt and Nancy Gerlach, authors of "The Whole Chile Pepper Book," the poblano pepper's heat places it at about 1,000 to 2,000 on the scoville scale. Some poblano peppers are hotter than others due to varied levels of capsaicin. Both mild and hot peppers often grow on the same plant. 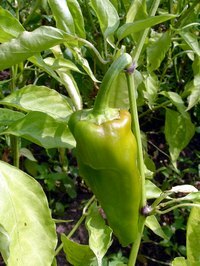 With a rating of 1,000 to 2,000 SHU, the poblano pepper is hotter than a bell, pepperoncini or pimento pepper. However, peppers such as the jalapeno (2,500 to 8,000 SHU) and the habanero (100,000 to 350,000 SHU) are significantly spicier than the poblano.